The Olympics kick off in Rio de Janeiro this week, so we thought it a good occasion to recall a Londoner intimately associated with the Olympics, though not as an athlete but as a coach. 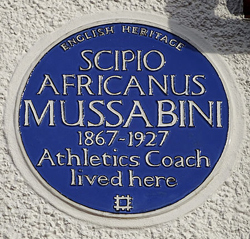 Born in Blackheath, Scipio Africanus – ‘Sam’ – Mussabini was a pioneering athletics coach who, in early 20th century, coached 11 athletes to win medals, including five gold, over five different Olympic Games. Mussabini, the son of a Syrian-Italian father and French mother, was educated in France and worked, like his father, in journalism, writing for sports magazines and specialising in billiards (which he also played to a high standard). From the 1890s, he started working, first as a cycling coach and later as an athletics coach in south London, based at Herne Hill Stadium. His first major success as the latter came when young South African sprinter, Reggie Walker, won gold in the 100 metres at the 1908 London Olympics. In 1913, he was appointed coach of the Polytechnic Harriers at the Herne Hill athletics track. He would go on to train the likes of Albert Hill – he won gold in the 800 and 1,500 metres at the 1920 Olympics in Antwerp – and his most famous student Harold Abrahams who won gold in the 100 metres and silver in the 4 x 100 metre relay at the 1924 Paris Olympics – a role which is depicted in the 1981 film Chariots of Fire (the coach is played by Ian Holm). Mussabini is famous for the comprehensive and systematic approach he took to training his athletes, an approach which covered the athletes’ lifestyle and diet as well as a rigorous training regime, and which saw him use techniques such as using a cine-camera t0 film his athletes in action and then analysing the footage. He is also noted for having ensured female athletes, like world record sprinter Vera Palmer-Searle, received high quality coaching. As a paid coach in an age when most were amateurs, he was ostracised by the establishment and apparently only started to receive the recognition he deserved well after his death, particularly following his depiction in Chariots of Fire. Mussabini, who suffered from diabetes, died in March, 1927, at the age of 60. He was buried in Hampstead Cemetery. There is an English Heritage blue plaque on the house he lived in at 84 Burbage Road (it backs onto the Herne Hill Stadium) between 1911 and 1916. Mussabini was inducted into the English Athletics Hall of Fame in 2011 while the Mussabini Medal was awarded every year between 1998 and 2007 by Sports Coach UK to honour outstanding coaches.